BuyInCoins is an actively developing Chinese internet-shop with a great variety of items, constant discounts and free delivery regardless of the amount. Different things can be found here: cell phones, computer accessories, games, electronic devices, tablets, sporting items, cosmetics etc. And the prices here are, very likely, lower than in any other internet-shop with a free delivery. You can save from 20 to 40% of your money here, in comparison with other Chinese shops. It is recommended to register on the web-site before buying something so that you can avoid difficulties connected with ordering and further tracking, communication and technical support. There are lots of exclusive possibilities available only to a registered user. And the registration itself will not take more than two minutes. The BuyInCoins delivery is available all over the world regardless of the order. If your order is more than $30 you get a free track-number and the delivery is through Register Air Mail. If the order is less than $20 the track-number will not be given, though you can buy it for extra $1.9. The delivery terms do not depend on the presence of a track-number. The medium terms are from 20 to 25 days. There might be delays due to holydays or the custom house work. When its New Year time the delivery might even take 40 days if you are not lucky. You can also order a delivery with EMS, but for extra payment. It is more expensive, but much quicker. 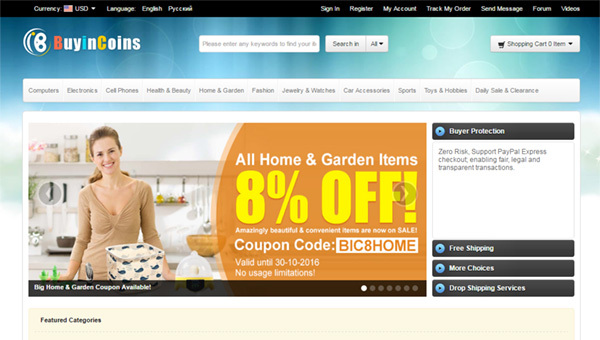 If you search for BuyInCoins coupons in the searching systems you can find valid coupons that can give you a discount of 8%, 5% or 2%. In order to use your discount you should tap a code word in “Have a Coupon Code?” field. There are also discounts like 2%dropper – unlimited 2% discount, and a one-off 5%eBay2012 discount. Coins are your virtual funds that are used to pay a part of the price of your order. How do you get Coins? First way is to write comments on the items you bought. You get a $0.1 for an ordinary review and $0.2 for a comment and your picture attached. You can write in any language. After your post is checked by the moderator it is published and you receive the Coins. You can check the amount of Coins on your account in the "My Coins" section . The second way is to receive Coins when people make purchase and point you out as a recommender in the "Have a recommender" field. The person who did that receives an extra discount of 5% for his order, and you receive 5% from his order in Coins. In order to spend the Coins you earned you should chose the second payment type Standart Check Out after your item is added to the basket. On the next page in the right lower corner you can see the Point Coins column-these are your coins. After that enter the number of coins you want to spend in the Apply Amount field (use dot as a separator) and tap Submit. The total amount of your coins reduces after that. Then you chose or inscribe the delivery address and click on the "Confirm Order" field. The site has some cons. Firstly, the search is not very convenient and cannot always help you find the item you need. Secondly, the interface of the site is uninformative-you may have difficulties with the understanding of the products purpose and the images don’t always match the item itself. Moreover, the choice of items is quite limited, comparing to the concurrent shops. Nevertheless the prices make you disregard all the minuses because you can save from 20 to 40% if you buy here. Does BuyInCoins accept Nigeria debit naira master card? Do they extend their service to Africa, Nigeria in particular? it is accepted regardless as long as you have sufficient funds..
That's way more clever than I was excpgtine. Thanks!